The funky rebel’s last stand. 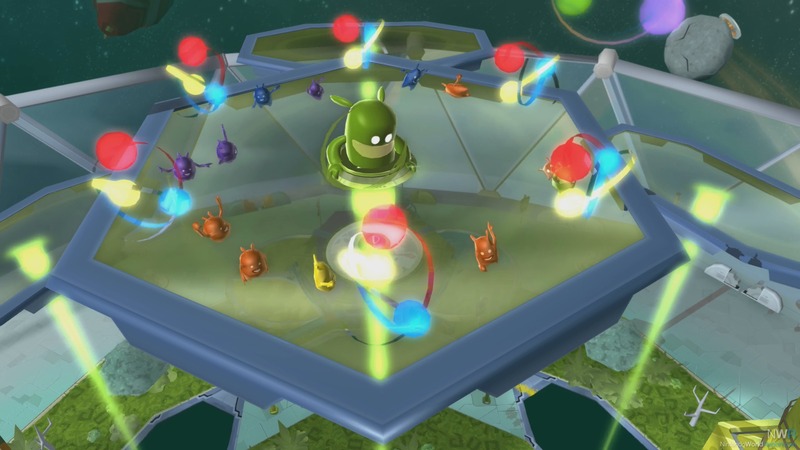 After seeing De Blob make a return on the Switch with its stunning HD makeover, it was nice to see that its sequel, De Blob 2, would also be making a comeback on the Switch. 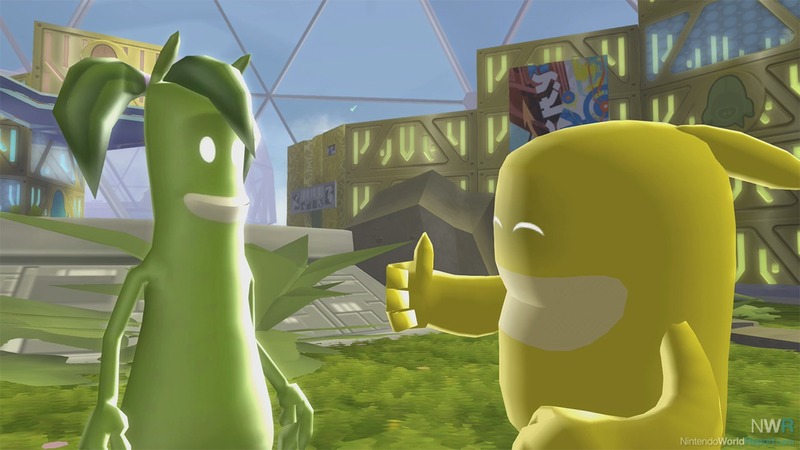 Sadly, while it may not be bringing any new content or features for its Switch debut, De Blob 2 still packs more than enough content to win any crowd over. The Switch version is a port of the console versions of De Blob 2 and picks up where the DS version of De Blob 2 left off (as strange as that may sound). 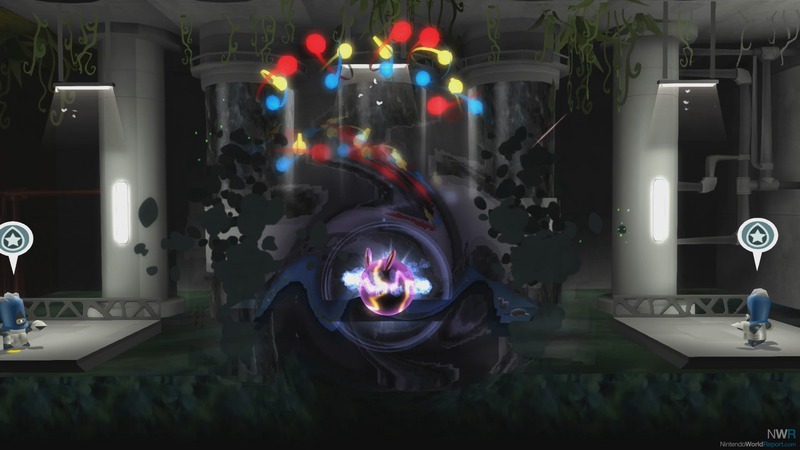 Blob and Pinkie are peacefully roaming the skies of Chroma City when you get a message from the Professor that Comrade Black had returned to Chroma City and that the duo must track him down and defeat him before he is able to cause any more chaos and devastation to the city. The pair agrees and sets out on their quest to find Comrade Black and take him down once and for all. Similar to the first game, the main objective is to use the color absorbed by Blob and Pinkie to repaint the city, take back important landmarks, and eliminate the INKT soldiers. There are a total of eleven large levels that make up the experience, letting you explore the different parts of Chroma City. This version is far different from the first De Blob in numerous ways. For starters rather than collect points to unlock checkpoints and eventually the exit, this version has you complete a set of missions until you reach the end of the level. Also, rather than have the player continuously timed as they explored the area, the game instead only has a timer for how long you have to complete the main mission, and then you have an unlimited amount of time to explore the area after the main missions are completed. The game is also completely free of motion controls, unlike its predecessor, and I am glad that motion controls didn’t make a return here. I feel this way mainly because there are many more mechanics added to the game that require more precise movements that would be nearly impossible to achieve with motion controls. There isn’t much of a visual change between the Switch version and the other versions of the game. It’s possible that there’s a minor enhancement to the overall visuals, but I couldn’t find it significant enough to make a thorough comparison between the newer and older version of De Blob 2. One feature that was in the previous game that I do miss is the ability to choose the type of music you wanted to play in the background as it allowed for the player to explore the world while listening to their favorite track. The feature of a few notes being played of certain instruments as you painted the city, such as red adding notes of a saxophone solo, was also another cool feature that was tragically cut from the sequel. Overall, if you’re a fan of the De Blob series or if you’re just looking for a nice and peaceful game to add to your Switch library, I’d recommend giving this one a shot and letting your inner graffiti artist run wild.